We took my son to see this movie with two of his close friends as part of his 10th birthday celebrations. This meant that our whole family had to endure it so we hoped it would be good. I must say I was fully entertained and so were the older and younger kids. It was barely an hour and a half so there wasn’t time to drag on the story. Every minute was full of something amusing and it was pretty fast paced. My only issue with the movie was that we had already seen many of the funny scenes in the preview. The movie was short so maybe they should have done a shorter preview so as not to ruin the surprises. Other than that, however, the movie was a great, family friendly comedy. It was funny and yet had a message. It was about a boy, Alexander, who has a horrible day but no one in his family seems to sympathize. Then he makes a wish on his birthday candle that they could understand how he feels. Suddenly, on his birthday, the whole family seems to be having a very bad day and yet they deal with it as a family. It’s a fun ride. 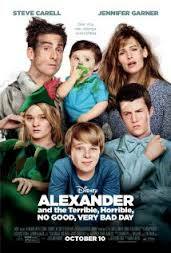 It is clean humor and Steve Carell and Jennifer Garner do a great job as the parents. Steve Carell always has such an endearing way of being hilarious. If you’re looking for a cute, funny movie then I recommend watching it. This entry was posted in Entertainment, Movies, Parenting and tagged Alexander and the terrible, alexander movie, family movie, horrible, Jennifer Garner, kids movie, no good, steve carell, very bad day, very bad day movie. Bookmark the permalink.